EPL-120 Engine Pre Lube Tank, 12QT. BROUGHT IN A FOUR POINT EIGHT LS FROM THE BONEYARD. AFTER INSPECTION OF OUR USED PARTS WE WERE SATISFIED THAT THE BOTTOM END WAS IN GOOD SHAPE. THEN WE HAD THIS WELCOME SURPRISE, A PAIR OF FACTORY LS SIX HEADS TO WORK WITH. WE SPRUNG FOR A MUCH MORE AGGRESSIVE CAM FROM COMP ALONG WITH INDUSTRY STANDARD REPLACEMENTS LIKE THE TIMING CHAIN AND OIL PUMP. WE BEAD BLASTED THE HEADS, ADDRESSED THEIR DECK, LAPPED IN THE VALVES, AND TOUCHED UP THE INTAKE THROATS. THEN WE INSTALLED A NEW SUMMIT VALVE SPRING KIT WITH STIFFER BEE HIVE SPRINGS. 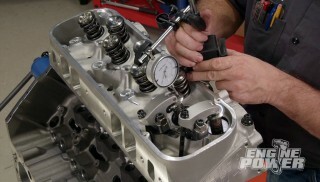 AND AFTER A TRUNION UPGRADE REINSTALLED THE FACTORY ROCKER ARMS TO FINISH UP OUR LONG BLOCK. (JOHN)>> AT THIS POINT HERE WE'RE ONLY ABOUT $1,500 DOLLARS TOTAL INTO THIS ENGINE PROJECT. WE'VE GOT $275 IN THE LONG BLOCK PLUS THE COIL PACKS, AND A LITTLE OVER $1,200 BUCKS IN GO FAST PARTS. SO TODAY IS OUR PAY DAY WHERE WE GET THE TOP END FINISHED AND GET IT STRAPPED TO THE DYNO. 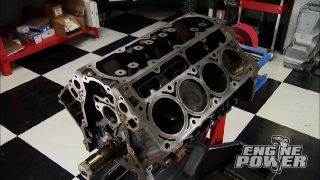 NOW WE'RE GONNA GO OVER A COUPLE OF THE MOST COMMON WAYS GUYS ARE GETTING AIR, FUEL, AND SPARK INTO THESE LITTLE LS ENGINE SWAPS. AND HOPEFULLY GET TO THAT 375 TO 400 HORSEPOWER RANGE, WE'LL SEE. (MIKE)>> AND THOSE THREE THINGS INCLUDE A STREET FRIENDLY HOLLEY CARBURETOR WITH VACUUM SECONDARIES AND AN ELECTRIC CHOKE. THE SECOND IS A MORE STREET/STRIP ORIENTED CARB. IT'S A DOUBLE PUMPER WITH MECHANICAL SECONDARIES AND A MECHANICAL CHOKE. 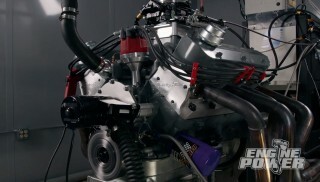 THIRD IS HOLLEY'S SELF LEARNING ELECTRONIC FUEL INJECTION. NOW AT THIS POINT IF YOU DON'T HAVE THE INDUCTION OR FUEL DELIVERY, THAT'S WHERE YOU'RE GONNA SPEND SOME DOUGH. OUR INTAKE MANIFOLD IS A DUAL PLANE PIECE WITH CATHEDRAL PORTS. NOW WE'VE USED IT ON SEVERAL DYNO ENGINES. IT ACCEPTS OE GM INTAKE GASKETS, AND HERE'S A QUICK LITTLE TIP. BY PUTTING A THIN COAT OF WD 40 ON THE HEAD SURFACE, THIS ALLOWS THE GASKETS TO WALK AND SEAT, MAKING A PERFECT SEAL. TORQUE THE BOLTS TO 11 FOOT POUNDS IN A CRISS CROSS PATTERN. 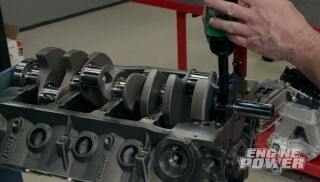 TO CONTROL THE IGNITION AND TIMING, A SIX LSTWO THAT MOUNTS ON THE CASTING BOSSES ON THE INTAKE. (JOHN)>> NOW THAT BOX MIKE JUST INSTALLED IS FOR A 58 TOOTH RELUCTOR. NOW A LOT OF THE OLDER STYLE ENGINES USE THE 24 TOOTH. SO HOW DO YOU TELL THE DIFFERENCE? IS COVERED UP WITH MUD AND GREASE. WELL IF THE KNOCK SENSORS ARE DOWN HERE BY THE OIL PAN RAIL IT'S 58, IF IT'S UP UNDER THE INTAKE, IT'S A 24. NOW BOTH SENSORS ARE HALL EFFECTS, WHICH USE THREE WIRES, POSITIVE, NEGATIVE, AND A SIGNAL. WHEN THE RELUCTOR WHEEL'S TEETH PASS BY THE SENSOR, THAT'S WHEN IT INTERRUPTS THE SENSOR'S SIGNAL. IT SENDS THAT INFORMATION TO THE PCM, OR IN OUR CASE THE MSD BOX, TO DETERMINE THE POSITION OF THE CRANKSHAFT IN RELATION TO THE NUMBER ONE CYLINDER. (JOE)>> TO COVER THE VALVE TRAIN PRO FORM'S NEW VALVE COVERS JUST FOR THE LS WITH A FULL LENGTH OIL RESTRICTING BAFFLE UNDERNEATH. THEY'RE TALLER THAN STOCK TO FIT LARGER AFTERMARKET VALVETRAINS. THAT KILLER TEXTURED POWDER COAT FINISH LOOKS GOOD ON ANY LS ENGINE. PLUS THEY COME WITH THE HARDWARE FOR A CENTER BOLT MOUNTING OPTION. ON THE SIDE ARE THREADED MOUNTING HOLES FOR THE ADDITION OF THESE IGNITION COIL BRACKETS. THE BRACKETS ARE AN ADD ON AND RAISE OUR FACTORY COILS SO YOU CAN SUPPORT THAT CHEVY LOGO. NOW WE DIDN'T GET THE COIL HARNESS WITH THE COILS. SO THIS AFTERMARKET SET WILL FILL THE BILL. FROM THE IGNITION CONTROLLER WE RUN THE HARNESS TO THE PASSENGER SIDE AND MAKE THE FIRST CONNECTION TO THE COIL HARNESS. THEN THE CRANK SENSOR. THE MAP SENSOR DOESN'T GET USED. SO WE NOW CONNECT THE DRIVER'S SIDE COIL HARNESS, AND FINALLY THE CAM SENSOR. BEFORE WE ADD PLUGS, WIRES, AND HEADERS TO THIS THING THERE'S AN OILING CONCERN WE NEED TO ADDRESS THAT RELATES TO SWAPS LIKE OURS. THERE'S AN IN AND OUT ON THE OIL PAN THAT'S DESIGNED FOR FACTORY OIL COOLER LINES. IT'S ALSO GREAT FOR DRAWING OIL PRESSURE, RUNNING AN OIL TEMP SENSOR, OR EVEN SUPPLYING OIL TO THE TURBO. WE NEED TO ADDRESS THIS NOW BECAUSE ONCE THE HEADERS ARE INSTALLED THERE'S NOT ENOUGH ROOM TO GET IN THERE. WHATEVER YOU DO YOU CAN'T LOCK THIS THING OFF WITH A FLAT PLATE. YOU HAVE TO CONNECT THE IN AND OUT WITH AN OIL BYPASS PLATE. NOW WE'RE GONNA HAVE CONTINUOUS OIL FLOW AND WON'T HAVE TO WORRY ABOUT OIL COOLER LINES. DELIVERY PIECES WE'LL TEST OUT WHEN WE COME BACK. WE'RE BACK, HOOKED UP, AND READY FOR THE FIRST OF THREE FUEL ADDERS. NOW EACH ONE HAS ITS PLACE, AND WE'LL SEE WHICH ONE WORKS BEST FOR THIS ENGINE. BECAUSE OF WHERE THE MSD BOX IS MOUNTED WE HAVE TO RUN A CARB SPACER SO THE CARBURETOR CLEARS IT. NOW IT HAS TO BE IN THE RIGHT ORIENTATION AND WE'LL RUN THE SPACER ON ALL THREE FUEL ADDERS. FIRST UP IS THE VACUUM SECONDARY 570 CFM CARB. SEEM SMALL, WELL THE ENGINE IS ONLY 293 CUBIC INCHES. A CARBURETOR'S CFM RATING IS BASED ON HOW WELL THE ENGINE BREATHES, OR ITS VOLUMETRIC EFFICIENCY. NOW A PERFORMANCE ENGINE LIKE OURS HAS ABOUT 85 PERCENT EFFICIENCY AT MAXIMUM TORQUE. 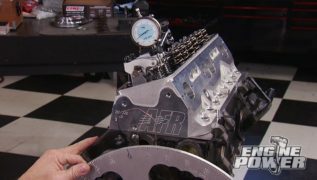 SO ON HOLLEY'S CARB CHART WE'RE GONNA TURN THE ENGINE 6,200 RPM AND JUST BELOW 300 CUBIC INCHES SHOWS THAT WE NEED 570 CFM. ONLY ONE SWITCHED 12 VOLT HOOK UP IS NEED FOR THE IGNITION BOX, AND WE'LL USE THE LAPTOP TO BUILD A TIMING MAP USING THE MSD SOFTWARE. WE'LL PUT 23 TOTAL DEGREES IN FOR NOW. WE'RE FILLING THE ENGINE WITH ROYAL PURPLE XPR FIVEW-30 FROM OUR GOODSON PRIMING TANK. WE'RE PUMPING 89 OCTANE THROUGH THE SYSTEM TO GET ALONG WITH OUR 10.5 TO ONE COMPRESSION RATIO. STABILIZE SIXFOUR. (JOHN)>> YEAH BUDDY, OKAY, YOU READY TO FIRE UP? IT WITH OUR STACK THAT HOUSES OUR AIR TURBINE. ALL THAT'S LEFT IS TO GET IT UP TO TEMP AND SEE WHAT THIS COMBO CAN DO. 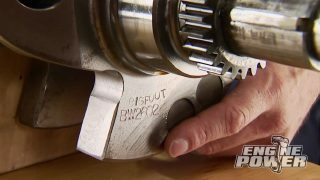 THE FIRST PULL WILL BE A SWEEP FROM 2,800 TO 6,200 RPM. THE VACUUM SECONDARIES OPEN UP AROUND 3,200 RPM AND WE MAINTAIN GOOD OIL PRESSURE. THAT THING SOUNDED REALLY GOOD, LOADED UP REALLY NICE. 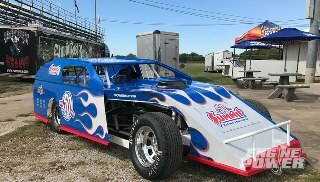 (MIKE)>> 343 ON POWER, 312 FOOT POUNDS OF TORQUE. (JOHN)>> THAT'S NOT BAD FOR THE FIRST PULL. US BETTER NUMBERS. 356 ON POWER, 317 ON TORQUE. NOW THIS THIRD RUN ITS EITHER GONNA STABILIZE OR CLIMB A LITTLE MORE, SO LETS SEE WHAT IT DOES. EVERYTHING IS THE SAME AS FAR AS TEMP, RPM, AND TIMING. FROM 23 TO 24 DEGREES. NOW THE ENGINE WAS STILL CLIMBING AT POWER AT 6,200, SO WE RAISED THE SWEEP TO 6,500. 367, 319! (JOHN)>> WE JUST GOT STARTED. 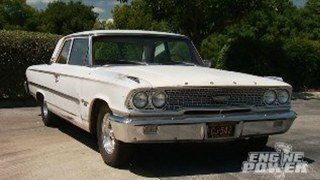 (MIKE)>> THIS LITTLE 570 HAD EXCELLENT IDLING CHARACTERISTICS, AND THE SECONDARIES CAME IN NICE AND SMOOTH. NOW THIS LITTLE THING GAVE US THE FUEL DELIVERY NEEDED TO MAKE ALMOST 370 HORSEPOWER IN THIS LITTLE FOUR POINT EIGHT. THAT'S NOT BAD. THAT ALSO GIVES US A GOOD IDEA, THIS IS AN EXCELLENT CARB FOR AN EVERYDAY STREET DRIVER. THE PRICE, $375 BUCKS. NOW IT'S TIME TO KICK IT UP TO A 600 CFM FOR ANOTHER TEST. (JOHN)>> NOW THIS DOUBLE PUMPER HAS 30 MORE CFM OF FLOW TOTALING 600. NOW IT'S A MECHANICAL SECONDARY DESIGN WITH A MANUAL CHOKE. NOW IT'S GEARED MORE TOWARDS A STREET/STRIP APPLICATION BUT USES THE SAME HARDWARE AS THE 570. (MIKE)>> ANOTHER FIRE UP AND BACK UP TO OPERATING TEMPERATURE. NOW WE'LL RUN THE ENGINE FROM 2,800 TO 6,500. IT HAS THE SAME 24 DEGREES OF TIMING, SO ANY DIFFERENCE WE SEE IS ALL CARBURETOR. OUT OF THE BOX WE MADE 370 HORSEPOWER AND 328 POUND FEET OF TORQUE. 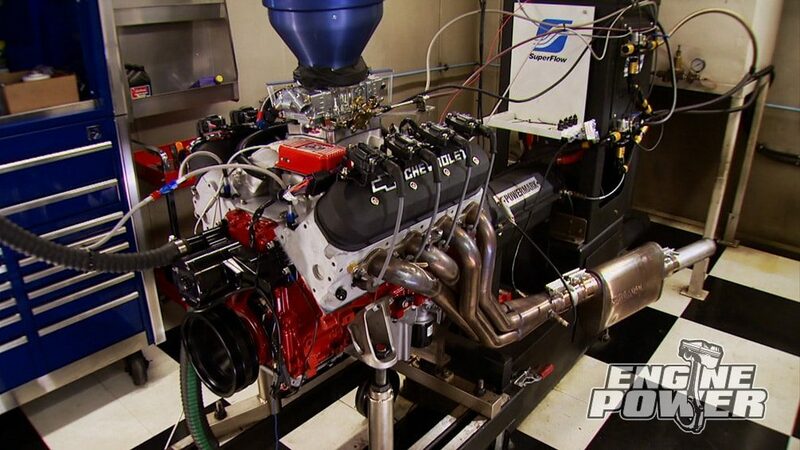 AFTER TWO MORE UNALTERED PULLS IT SETTLED IN AT 377 HORSEPOWER, 331 POUND FEET OF TORQUE. MAN THIS THING'S AWESOME. NOW LEAN IS MEAN, BUT WE LIKE IT SAFE. SO A JET SWAP IS THE NEXT MOVE. WE'LL CHANGE THE SECONDARY JETS ONLY, FROM 73 TO 75'S, TO RICHEN IT UP AT WIDE OPEN THROTTLE. 374 HORSEPOWER, 328 ON TORQUE, NOT BAD TO BE BACK IN THE SAFE AIR FUEL WINDOW. (JOHN)>> NOW THIS 600 CFM CARBURETOR WAS WORTH 11 MORE HORSEPOWER ON THE HIGH SIDE, SEVEN MORE IN THAT SAFE AIR/FUEL WINDOW. AT $395 DOLLARS FOR THIS ONE, WELL IT'S A PRETTY GOOD POWER UPGRADE FOR ONLY $20 EXTRA BUCKS. NOW WE'RE NOT DONE JUST YET. WHEN WE GET BACK IT'LL BE TIME FOR EFI. 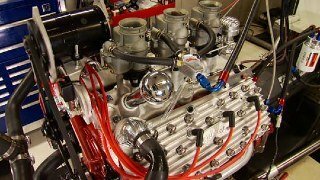 OF THREE FUEL ADDERS, HOLLEY'S TERMINATOR SELF LEARNING FUEL INJECTION. NOW THE THROTTLE BODY IS 950 CFM AND INCORPORATES 80 POUND AN HOUR INJECTORS. 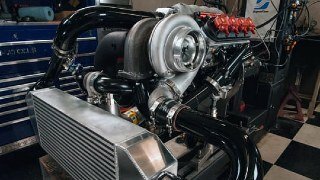 SO THIS UNIT WILL SUPPORT ENGINES FROM 250 TO 600 HORSEPOWER. THE CONNECTIONS TO EACH ONE OF THE SENSORS, THEY PREWIRED IT FOR US INTO THIS SINGLE BULKHEAD. SO ONE CONNECTION, IT'S THAT SIMPLE. (JOHN)>> ONLY FOUR LOOSE WIRES NEED TO BE HOOKED UP. THE FIRST TWO ARE THE NEGATIVE AND THE POSITIVE, WHICH HAVE TO GO DIRECTLY TO THE BATTERY POST. THE THIRD IS A 12 VOLT CONNECTION. THIS NEEDS TO GO TO A SWITCHED IGNITION SOURCE. AND THE FOURTH IS A TACH SIGNAL FROM THE MSD BOX. THIS LETS THE EFI KNOW WHEN TO FIRE THE INJECTORS. SHOULDN'T BE AN ISSUE. AND IT WASN'T, 311 HORSEPOWER, 227 POUND FEET OF TORQUE. THE NEXT SWEEP WILL BE FROM 2,500 TO 5,000 RPM. WITH THE SYSTEM DOING ITS JOB THE ENGINE MADE 322 HORSEPOWER AND 304 POUND FEET OF TORQUE. IT'S READY FOR MORE RPM, THIS TIME FROM 3,000 TO 6,500. WHAT'S ANOTHER 1,500 RPM WORTH? WOW, YOU DID IT. LOOK AT THAT, IT'S LEARNING 394, 324, WOW! 394 HORSEPOWER AND CLIMBING LIKE A BEAR STILL. THIS IS A CIRCLE TRACK LITTLE MONSTER RIGHT HERE. (MIKE)>> $275 DOLLAR FOUR POINT EIGHT, UNREAL. (JOHN)>> SO TODAY WE'VE SHOWN YOU A COUPLE OF WAYS TO THROW FUEL AT ONE OF THESE LS PROJECTS. NOW YES, THE CARBURETORS DID RUN PRETTY GOOD AND ARE DEFINITELY MORE AFFORDABLE THAN THE EFI OPTION. BUT THERE IS A REASON WHY YOU WON'T FIND ONE ON AN OEM VEHICLE THIS SIDE OF THE '90'S. (MIKE)>> STEPPING UP TO FUEL INJECTION IS MORE EXPENSIVE, BUT IT ADDS SEVERAL BENEFITS TO THE EQUATION. TECHNOLOGY IS ONE, THERE'S A LOT OF SPECIALIZED COMPONENTS, SO NATURALLY THEY ARE MORE EXPENSIVE. NOW A SYSTEM LIKE THIS THAT OPERATES IN CLOSED LOOP IS ALWAYS GOING TO CORRECT ITSELF. SO NO MATTER WHAT ELEVATION, HUMIDITY, OR TEMPERATURE YOU'RE IN, IT'S ALWAYS GONNA FIND THAT TARGET AIR/FUEL RATIO THAT YOU ENTERED IN. SO A LAPTOP IS NEVER NEEDED. AND YOU CAN GET YOURS FOR UNDER $2,000. (ANNOUNCER)>> UP NEXT, SEE THE WILDEST MOST COMPETITIVE ENGINE SWAP CHALLENGE AROUND, TWO TEAMS, LOTS OF SKILL, BUT ONLY ONE WILL CLAIM THE TITLE, STAY WITH US. SWAP CHALLENGE AT HOLLEY'S LS FEST. 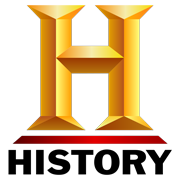 NOW AT THE MOST RECENT EVENT TWO NEW TEAMS FACED NEW RULES THAT MADE WINNING MORE CHALLENGING THAN EVER. (BILL)>> THEY DON'T EVEN KNOW WHAT THE CARS ARE UNTIL WE HIT THE HORN AND THEY PULL BACK THE COVERS. SAME RULES AS BEFORE, ONLY HAND TOOLS. THE GUY THAT GETS DONE FIRST KEEPS THE ENGINE AND THAT'S HOW IT'S GONNA GO. WORKING ON, WE CAN'T PRACTICE ON ANYTHING. (KEILUM)>> I THINK IT'S PROBABLY A SECOND GEN CAMARO. 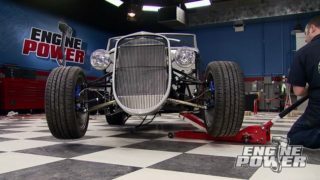 (ADAM)>> I'M GONNA BE DIVING UNDER THE CAR DOING BELL HOUSING BOLTS AND TORQUE CONVERTER STUFF, AND HE'S GONNA BE UP TOP. (MICHAEL)>> I'VE GOT A CAMARO WE'VE BEEN PLAYING WITH WITH AN LS MOTOR. (ADAM)>> AND WE'VE KINDA GOT IT LAID OUT IN ORDER OF WHAT WE WANT TO DO IT IN, WHO'S DOING WHAT AND WHEN. SO SOMEONE'S ALWAYS DOING SOMETHING. (JOE)>> EVERY YEAR OUR FRIEND CHATTY CHAD REYNOLDS SERVES AS THE PLAY BY PLAY GUY. EACH CAR IS AN IDENTICALLY PREPPED SECOND GEN CAMARO WITH A FACTORY SMALL BLOCK. FOR A WHILE THE TWO TEAMS ON ARE ON THE SAME PACE BUT ONLY FOR A WHILE. (CHAD)>> THEY'RE UNDERNEATH THIS THING AND THEY HAVE BEEN FOR A WHILE. I'M NOT SURE WHAT IT IS THEY'RE TRYING TO REMOVE. 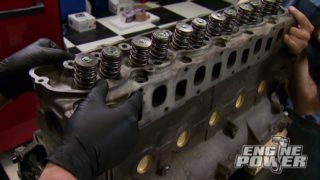 (JOE)>> THE NEW LS ENGINE HAS A SIX LITER IRON BLOCK AND A HOLLEY HIGH RISE INTAKE THAT'S GOT TO COME OFF FOR CLEARANCE PURPOSES. 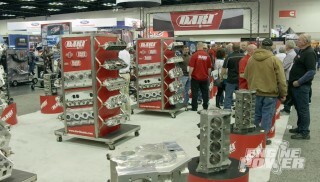 (CHAD)>> NOW IT'S GONNA BE A CHALLENGE TO SEE HOW QUICKLY THEY CAN GET THE NEW ONE PREPARED AND IN. THE SILVER TEAM HAS GOT THEIRS ON THE HOOK AND IT'S READY TO GO IN PLACE. (PETE)>> ALRIGHT GO UP, WE GOTTA GO UP. ALRIGHT, COME ON DOWN A LITTLE BIT. (JOE)>> THE GRAY CAMARO TEAM ENDURES A FEW FITMENT ISSUES. 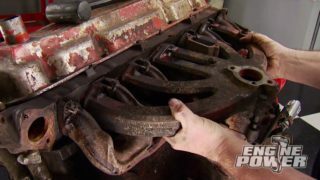 (PETE)>> DUDE, WE'VE GOT TO GET THESE MOLD BOLTS STUCK THROUGH. THE BOLTS ARE TOO LONG, THEY'RE UP AGAINST FIREWALL. (CHAD)>> BOLTS ARE TOO LONG, THEY'RE UP AGAINST THE FIREWALL. (PETE)>> DUDE THEY DON'T HAVE THEIR MOTOR IN THE CAR. JUST MAKE SURE WE GET IT RIGHT OKAY. (JOE)>> THE BLUE CAMARO TEAM CONTINUES THEIR SWAP BECAUSE IT ISN'T OVER YET. THE GRAY TEAM HAS TO PASS AN INSPECTION. 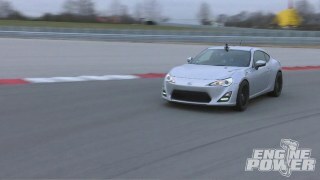 AND TAKE THE CAR FOR A SHORT SPIN TO PROVE THEIR SWAP WAS A REAL SUCCESS. WITH AN OFFICIAL TIME OF ONE HOUR AND 41 MINUTES, PETE AND ADAM HAVE AN LS PRIZE TO HAUL HOME. AND BRAGGING RIGHTS UNTIL NEXT YEAR. 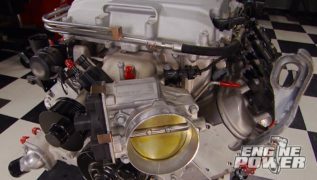 (JOHN)>> FOR YOU SIXONE HEMI GUYS THAT WANT TO MAKE SOME BIG POWER, WELL EDELBROCK NOW OFFERS A COMPETITION SERIES SUPERCHARGER SYSTEM FOR THE RACER AND TUNER IN MIND. NOW IT COMES WITH A TDS 2,300 SUPERCHARGER, INTEGRATED INTAKE MANIFOLD, AS WELL AS THOSE BIG LONG INTAKE RUNNERS TO MAKE THAT BIG LOW END TORQUE. NOW IT COME WITH A HEAT EXCHANGER, AIR INLET SYSTEM, HARNESS, PUMP AND BALANCER, BUT YOU'RE GONNA HAVE TO FINISH IT OUT WITH THE CUSTOM PARTS THAT YOU NEED TO FINISH YOUR KIT. NOW YOU'RE ACTUALLY GONNA SEE US USE THIS SYSTEM TO TRY TO BREAK 800 HORSEPOWER LATER IN THE YEAR. BUT IF YOU CAN'T WAIT, WELL YOU CAN GET YOURS FOR $6,500. (JOE)>> HOW WOULD YOU LIKE TO IMPROVE YOUR VEHICLE'S BRAKING 25 PERCENT JUST BY SWAPPING OUT THE PADS? WELL YOU CAN IF THOSE PADS HAPPEN TO BE THE GREEN STUFF FROM EBC BRAKES. BETTER PEDAL FEEL AT LOW SPEEDS, AND THEY HAVE THE SPECIAL BREAK IN COATING THAT GIVES YOU INSTANTLY SAFE BREAKING AS SOON AS YOU INSTALL THEM. NOW THEY'VE GOT THEM FOR SUBCOMPACTS, TRUCKS, AND SUV'S, AND YOU CAN PICK THEM UP AT YOUR LOCAL PARTS HOUSE. WELL TIME FOR US TO HEAD TO THE HOUSE, WE'LL SEE YOU NEXT TIME.